For Legacy Planning Associates, ActiveCanvas designed two key marketing pieces. 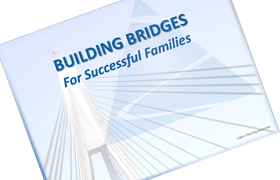 The first piece is a 4-page brochure; the second is a 22-slide PowerPoint presentation used to help families understand the difference between the old and new paradigms of legacy planning, and how they can build bridges inside their own family in order to thrive as family even in future generations. We designed a custom template used a sky blue gradient and embedded within each slide a watermark of the Legacy Planning logo. To reinforce the brand message, we used photo images from the website whoever possible. The presentation was designed to present a serious topic in a soft way, with just a tiny sprinkle of humor tossed in to keep everyone’s attention.